As the 9th club of the Korean Football League, the Suwon Bluewings were unveiled in the winter of 1995 on December 9th.? Their sponsor was to be one of the highest profile companies in all of Korea, Samsung Electronics. Due to having such a big name sponsor, Suwon set out for immediate success. To achieve this, they hired Kim Ho, who led the Korean national team at the 1994 World Cup, to be their first manager.? The goals set out before the team were to become K-League champions in 3 years, Asian Champions in 5 years, and in 10 years become a world renowned club.? It didn’t take long for Suwon to make their impact on the K-league, as they beat defending champions Ulsan Hyundai 2-0 in their opening game. It was truly a historical moment for the K-league.? During their first season, Suwon finished third in the first stage of the season and suffered only one loss on their way to winning the second half league title.? In the championship final that year, they met Ulsan in a two-legged final. The first game in Ulsan was won by Suwon and everyone expected a fairytale ending for the first year team. However, due to some very suspicious refereeing in the second match, Suwon lost to Ulsan and had to settle for runner-up in their debut season. Add that to the fact that Suwon also finished runners-up in the FA Cup that year, one would say that it was a successful first season in Suwon. The ’97 season was a difficult one for Suwon in domestic competitions as they struggled in the K-league and Cup competitions. They did however make their name on the international level by making it to the final of the AFC Cup and beating Beijing Guan 5-0 in the semi-final to make it there. The final was played in Suwon and Saudi side Al Nasr defeated the home side 1-0 to take the crown.? The 1998 Suwon side featured some incredible talent like KoJongSoo, Lee Woon Jae, Serbian forward Sasha Drakulic, Russian winger Denis Laktinov and Romanian OlaaioKosmian. This team went through the season on a tear and brought Suwon their first K-league title after defeating Ulsan Hyundai in the final. The flashes of brilliance shown in 1998 was just the beginning for a young Suwon team that had their sights set on much higher goals in the ’99 season. 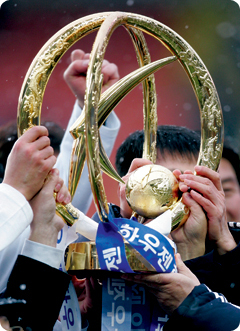 It was a truly remarkable year in which Suwon won all four K-league competitions. It all started when they crushed archrivals Anyang Cheetahs 5-1 in the K-league Super Cup. Then came the two Cup competitions, Daehan Cup and Adidas Cup.? To cap it all off, they defended their K-league title to finish off the most remarkable season in the K-league even to this day. At one point, Suwon was undefeated in 20 consecutive games at home including an incredible 13 game winning streak.? 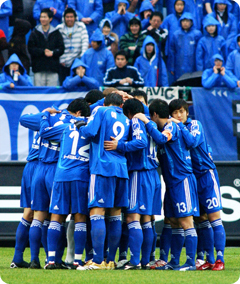 The K-league best eleven that season included six Suwon players and KoJongSoo took home the MVP award. That season Suwon also made it to the Asian Club Cup semi-final but fell to Saudi side Al Hiral. With the ushering in of a new millennium , Suwon began to show their true colors as an up-and-coming powerhouse of Asia. In the? 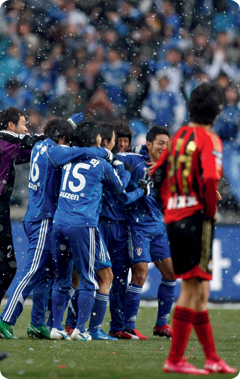 semi-final of the AFC Club Cup, Suwon beat Persepolis 1-0 and went on to beat Jubilo Iwata in the final. After that and a victory over Al Shabab in the AFC Super Cup, Suwon became the true champions of Asia. This came as even a surprise to Suwon because they were still a few years ahead of the goals they had set for themselves at the outset.? That same season in the K-League, Suwon won the Super Cup and the Adidas Cup but failed to capture the K-League championship.? In the next season’s AFC Club Cup, Suwon made it all the way to the final, where they met their fierce rivals Anyang LG. Thanks to some great play by goalie Lee Woon Jae, Suwon was able to retain the crown and remain champions of Asia for another year.?? 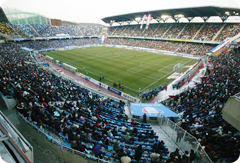 In June of 2002, Suwon met Al Hidad in the AFC Super Cup. They defeated the Saudi side and now hold the Super Cup forever because that was the last season it was held before the AFC changed the competition. It was in 2002 that Suwon captured the FA Cup, the only competition the manager Kim Ho had not won for Suwon. In 2003, Suwon failed to win any competitions and they felt it was time to move on to another manager.? Their next manager was to be one of the greatest Korean exports of all time. Two-time UEFA Cup winner and former manager of the Korean national team, Cha Bum Kun or better known as “Cha Boom” for his powerful strike. In his first season as manager in 2004, with the help of Brazilian import Nadson, Cha won the K-league championship and Nadson became the first non-Korean MVP.? 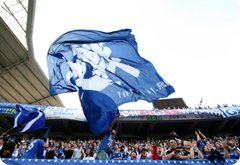 The next season, Suwon participated in the A3 championship, a competition between the champions of Korean, China, and Japan. They won that Cup and went on to win the Super Cup and Hauzen Cup, but by midseason, the busy schedule had taken its toll on the players and injuries started to pile up.? They were unable to defend their title. In 2007, with the likes of 2002 Korean World Cup heroes Song JongGug, Kim Nam Il, Ahn Jung Hwan, and Croatian defender Mato, Suwon finished runners-up in the K-league championship and the FA Cup.? 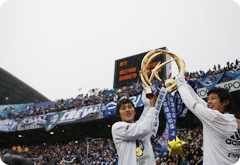 Having gone 4 years without any real hardware, Suwon stormed through the 2008 season without much real trouble. In October, they won the Hauzen Cup and one month later beat FC Seoul in the final to bring back home the K-league championship trophy.? Now, together they will return to Asia to reclaim their former glory with their goal being to win the Asian Champions League and getting to the FIFA Club World Cup.